Jani, R. A., Mahanty, S. and Setty, S. R. (2016). SNAREs in the maturation and function of LROs. Bioarchitecture 6(1): 1-11. Mahanty, S., Ravichandran, K., Chitirala, P., Prabha, J., Jani, R. A. and Setty, S. R. (2016). Rab9A is required for delivery of cargo from recycling endosomes to melanosomes. Pigment Cell Melanoma Res 29(1): 43-59. Dennis, M. K., Mantegazza, A. R., Snir, O. L., Tenza, D., Acosta-Ruiz, A., Delevoye, C., Zorger, R., Sitaram, A., de Jesus-Rojas, W., Ravichandran, K., Rux, J., Sviderskaya, E. V., Bennett, D. C., Raposo, G., Marks, M. S.* and Setty, S. R.* (2015). BLOC-2 targets recycling endosomal tubules to melanosomes for cargo delivery. J Cell Biol 209(4): 563-577. (*Equal contribution as a senior author). Jani, R. A. and Setty S. R. (2014). Membrane traffic and vesicle fusion: Post-Palade era researchers win the Nobel Prize. Resonance May: 1-25. Sitaram, A., Dennis, M. K., Chaudhuri, R., De Jesus-Rojas, W., Tenza, D., Setty, S. R., Wood, C. S., Sviderskaya, E. V., Bennett, D. C., Raposo, G., Bonifacino, J. S. and Marks, M. S. (2012). Differential recognition of a dileucine-based sorting signal by AP-1 and AP-3 reveals a requirement for both BLOC-1 and AP-3 in delivery of OCA2 to melanosomes. Mol Biol Cell 23(16): 3178-3192. Truschel, S. T., Simoes, S., Setty, S. R., Harper, D. C., Tenza, D., Thomas, P. C., Herman, K. E., Sackett, S. D., Cowan, D. C., Theos, A. C., Raposo, G. and Marks, M. S. (2009). ESCRT-I function is required for Tyrp1 transport from early endosomes to the melanosome limiting membrane. Traffic 10(9): 1318-1336. Setty, S. R., Tenza, D., Truschel, S. T., Chou, E., Sviderskaya, E. V., Theos, A. C., Lamoreux, M. L., Di Pietro, S. M., Starcevic, M., Bennett, D. C., Dell'Angelica, E. C., Raposo, G. and Marks, M. S. (2007). BLOC-1 is required for cargo-specific sorting from vacuolar early endosomes toward lysosome-related organelles. Mol Biol Cell 18(3): 768-780. Di Pietro, S. M., Falcon-Perez, J. M., Tenza, D., Setty, S. R., Marks, M. S., Raposo, G. and Dell'Angelica, E. C. (2006). BLOC-1 interacts with BLOC-2 and the AP-3 complex to facilitate protein trafficking on endosomes. Mol Biol Cell 17(9): 4027-4038. Robertson, S. E., Setty, S. R., Sitaram, A., Marks, M. S., Lewis, R. E. and Chou, M. M. (2006). Extracellular signal-regulated kinase regulates clathrin-independent endosomal trafficking. Mol Biol Cell 17(2): 645-657. Yoshino, A., Setty, S. R., Poynton, C., Whiteman, E. L., Saint-Pol, A., Burd, C. G., Johannes, L., Holzbaur, E. L., Koval, M., McCaffery, J. M. and Marks, M. S. (2005). tGolgin-1 (p230, golgin-245) modulates Shiga-toxin transport to the Golgi and Golgi motility towards the microtubule-organizing centre. J Cell Sci 118(Pt 10): 2279-2293. Burd, C. G., Strochlic, T. I. and Gangi Setty, S. R. (2004). Arf-like GTPases: not so Arf-like after all. Trends Cell Biol 14(12): 687-694. Setty, S. R., Strochlic, T. I., Tong, A. H., Boone, C. and Burd, C. G. (2004). Golgi targeting of ARF-like GTPase Arl3p requires its Na-acetylation and the integral membrane protein Sys1p. Nat Cell Biol 6(5): 414-419. Setty, S. R., Shin, M. E., Yoshino, A., Marks, M. S. and Burd, C. G. (2003). 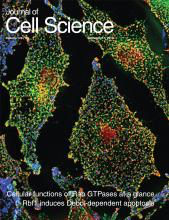 Golgi recruitment of GRIP domain proteins by Arf-like GTPase 1 is regulated by Arf-like GTPase 3. Curr Biol 13(5): 401-404. Subba Rao, G., Bachhawat, A. K. and Gupta, C. M. (2002). Two-hybrid-based analysis of protein-protein interactions of the yeast multidrug resistance protein, Pdr5p. Funct Integr Genomics 1(6): 357-366.